Kerstin Zilm discovered her love for being a reporter during the exciting times after the Berlin Wall came down. At RIAS Berlin (Radio In the American Sector) she explored all parts of the reunified city finding, recording and creating stories, which quickly became her passion and favorite thing to do. Kerstin worked as reporter, editor and host for German public radio stations including assignments as junior-correspondent in Washington D.C.. In April 2003 the German broadcasting network ARD sent her to Los Angeles on assignment as head of its U.S. West coast radio studio. Five years later Kerstin established her own production company soundslikerstin in Los Angeles working for radio, print, TV and Online publications. 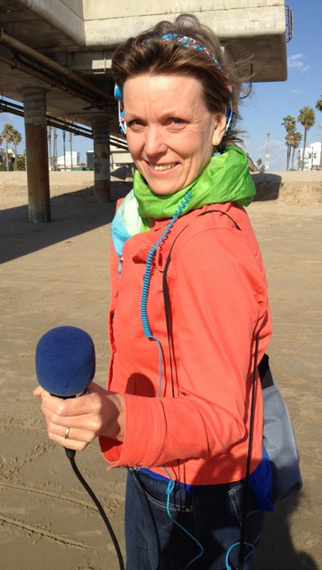 Kerstin Zilm produces a variety of stories for German and U.S. media from Academy Awards to Zen Yoga. Above all she enjoys exploring stories beyond headlines and stereotypes finding curiosity on the path less traveled guided by successes and failures of Hollywood legends and homeless in Hollywood. She interviews young German filmmakers, undocumented immigrants and successful entrepreneurs, inmates in overcrowded prisons, surf champions in Venice Beach and soldiers volunteering to go back to war. In California she found an infinite well of stories waiting to be told. 1998 and 2000 Deutschlandradio junior correspondent in Washington D.C.